This is the fourth in my series of State Fair art reviews. This year, as always, the State Fair Fine Arts exhibit provided visitors with the opportunity to see a wide range of talented Minnesotans. I was particularly happy to see a number of very fine impressionist and landscape painters on display. The selection committee was discerning and viewers were the beneficiaries. As I walked through the exhibit I tried to pay attention to the conversations going on around me. Minnesotans are a mostly positive bunch and tend to appreciate the effort almost as much as the art, They know what they like and from the conversations I could pick up on, they liked what they saw. If you want to see a larger view of any of the images in this story, simply click on them. 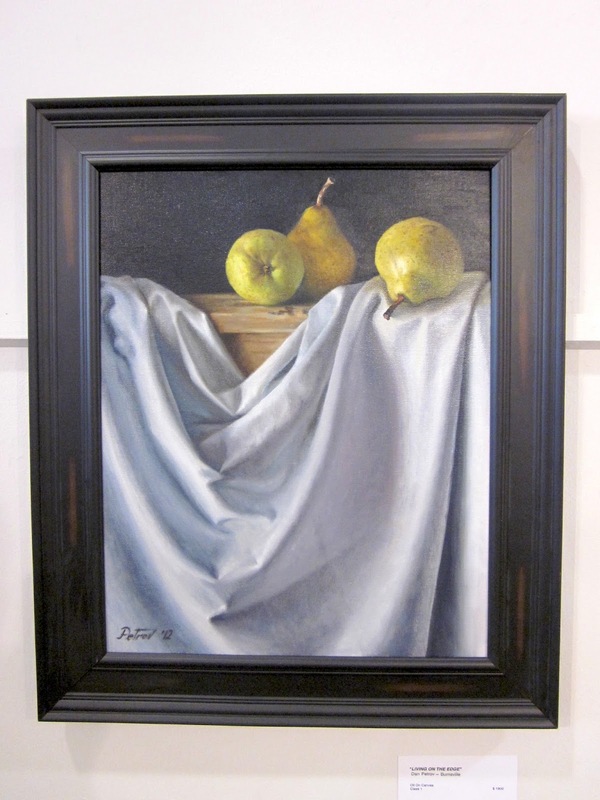 Mark Literski is an Arden Hills painter whose light touch and great eye reveal flashes of brilliance. Literski is a self confessed Edward Hopper admirer and his selectivity with the pallet reflects his measured approach. This acrylic painting titled, "CB In Water After Kanevsky", puts Mr Literski's considerable talents on displays. Literski finds the right balance of highlights and tonal shifts, but never overworks the subject. I respect his softening edges and undefined background. Literski allows the focal point to be just that. At no point does he overwhelm what the eye wants to see. I enjoyed this painting very much. Joshua Cunningham is a Saint Paul Artist whose work is simply outstanding. In full disclosure I should mention that I have long admired Cunningham's work and rank him among the finest painters currently working in the state. Cunningham's work, "February Frost"is a monumental achievement because it delivers on so many levels. The composition, colors and mood are captured expertly in this painting. Cunningham has this incredible ability to create and convey extraordinary beauty in ordinary scenes. As a result his paintings are convincing and they put you in the scene. Cunningham's considerable skill has grown over the years. Just when I think his work has to hit a plateau, he surprises me with some new interpretation and the results are superb. Joe Paquet's influence remains an enduring part of Cunningham's work, something I appreciate, yet his paintings are uniquely his own. From his selection of subject matter to his skillful choice of pallet, Cunningham is every bit an original. As I stood photographing Cunningham's painting an older gentleman approached and stood beside me. "It's almost a hundred degrees in here and that painting cools me off", said the gentleman, quickly adding, "Man, that's a good painting". I couldn't agree more. And many years from now, when art historians look back on this period, I am confident that Cunningham's paintings will stand singularly apart from many of his contemporaries and somewhere an art lover will say, "Man that's a good painting". "Living On The Edge" is Dan Petrov's entry to this years FIne Arts exhibit and it's a dandy. The clever use of space and the tenuous position of one of the pears add drama to the painting. Petrov does a fine job of capturing the light and the careful brushwork provides just the right amount of realism. Larry Holmann is a Minneapolis painter whose work in oil, "Tree Line" was one of my favorites at the exhibit. His separation of ground and sky and the effortless framing of the congregation of trees illustrates considerable skill. Holman's muted pallet gives rise to imagined colors. Stay tuned for the final installment in the series, coming soon.